For the purpose of this tip, I’ll stick to views that you save in model space, but you can save views on a layout, too. When you travel, you like to see beautiful views like the one shown here. AutoCAD views have their own kind of beauty, because they help you draw and edit more quickly. Display the part of your drawing that you want to be able to return to. You’ll use the ZOOM and PAN features to do this. 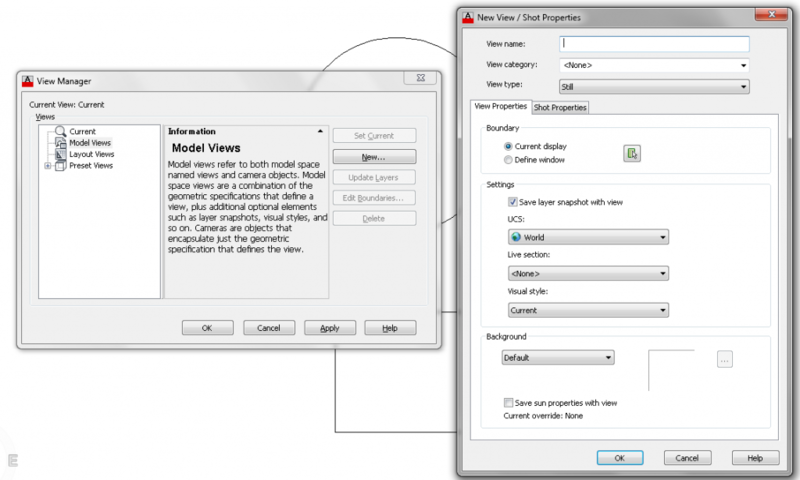 Choose View tab> Views panel> View Manager (the VIEW command) to open the View Manager dialog box. Click the New button to open the New View/Shot Properties dialog box. Type a name for the view in the View Name text box. 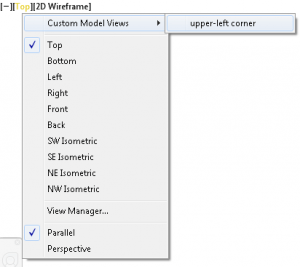 The View Properties tab defaults to using the current display, but if you forgot to display the right part of your drawing before you started, choose Define Window. You immediately return to your drawing. At the Specify first corner: prompt, click one corner of the view you want to save. At the Specify opposite corner: prompt, click the diagonally opposite corner. Back in the View Manager, if you want to move to the new view (and you didn’t display it at the beginning), click Set Current. There are a couple of ways to display a view that you’ve saved. The quickest is to use the View Controls in the upper-left corner of your drawing area. (I think this feature was introduced in AutoCAD 2012.) You just click the View control, then choose Custom Model Views and then the view that you want. as you see here. Another way is to choose View tab, View panel and choose your view from the Views drop-down list, as you see here. Do you use named views? Please share any tips! I have been using named views for close to 20 yrs. beginning with R12 DOS. I currently have experience with Map 3D 2010, so I am not sure how many changes Adesk has made w/ the later versions. There is a toolbar for VIEWs which I keep displayed all the time which has a pulldown with all named views for whichever space you are currently in. Choose one of them and it is instantly displayed. For people using the ribbon, there’s a similar drop-down on the View menu and also directly on the upper-left corner of the drawing area. I use the ribbon, command line and toolbars depending on what I want to do. For me it is faster to just keep the VIEW toolbar displayed. It allows me to change views with one click as opposed to two or three when using the ribbon. Thanx Ellen! I’ve been working with the 2011LT version for less than a year, so ANY AND ALL tips are more than welcome. i will definitely be keeping an eye on your site. Excellent advise. I use it in Civil 3D 2013 and the problem it has, is that it takes about 20 secs to perform. Despite having 20 GB or memory ram, it still takes a lot of time. I wonder, if among Civil 3D users there is a way to expedite the execution of the view command. Thanks all and keep up the good work. I use C3D 2014 all day long and I always have several large images attached in my drawings. If you are having delays upon switching views, you can try a few things to help reduce the process time. But I can tell you I have a beast machine as well. and I still run into these processing times as well. But I have found a way that does cut the time down. I know it’s not a lot of information, but it does help me and it’s what I perform on a regular basis. Hope this helps and CAD On my friend!